A number of top Indian politicians are filling the jails now. That's really good news. Sukhram will, at age 86, have the pleasure of having his entire life's reputation wiped out, and cooling his last few years of life in jail. I have no sympathy for rascals like him. If it were purely up to me, I'd like to see them hanged, but, of course, I respect the idea that there must be some proportionality of punishment to the crime. These kinds of people should never have been allowed to enter politics in the first place. But, of course, Nehru's Congress Party ONLY ACCEPTS THE CORRUPT. If you show any sign of honesty, you can't even come close to the Congress. The situation has become so dire that 99 per cent of India's politicians today are TOTALLY CORRUPT (including those from BJP – don't imagine for a moment that BJP is honest!). These goons have no policy interests, only one interest: how to make money. EVERYONE in Congress, in particular, is corrupt. From the top to the bottom. In other parties you might find one or two honest people even today. For the Congress to try to dissociate itself from Sukhram is cute! NO ONE BELIEVES ONE WORD OF WHAT YOU SAY, CONGRESS. Stuff yourself and your lies. A gang of thugs you are, and EVERYONE IN THE WORLD knows it. I have had personal experience with one of your "respected" Chief Ministers who called me to his office and asked me (in the Cabinet room of Assam, in Dispur, when I was Director, Rural Development) to award a major cement contract to a private supplier whose bid in the public tender was not the lowest. I did not follow that goon's directions. I awarded the contract, instead, to the Cement Corporation of India, Bokajan, which had bid the lowest. I was transferred within days of awarding the contract in accordance with the rules and was dumped into a job which had less than 3 hours of work a day. That RASCAL "Chief Minister" is long dead and gone, but 100,000s of similar RASCALS are found within the Congress party today. Nehru's Congress has destroyed India. It has looted India in every possible way. It is time for good people to come together and offer India BETTER POLICIES AND HONEST PEOPLE. Join the Freedom Team of India, or expect the same mess to continue. I have always found it hard to understand spiritual matters. I do believe, nevertheless, that spiritualism must be a way to the Truth, and not a way to moral relativism or moral confusion. If spiritualism doesn’t help us distinguish good from evil, then it is surely a dangerous superstition, to be shunned and banished. It therefore bothers me no end when I hear, from those who profess to be spiritual, and who talk about the decay of spiritualism in India, that “Rahul Gandhi is the new hope for India”. Many of my pious relatives (many of them devoted to Godmen or Godwomen who proliferate in India like flies, or perhaps like leeches) have made such statements during this India trip. This section is addressed to them and to people like them. My blunt question to such spiritualists is this: How can a spiritual person even remotely think that a person like Rahul Gandhi, who has fully accepted the black money and corruption of his party, can help India in any way? He will surely help himself, but to help India requires a vision and clarity of policy thought, apart from impeccable integrity, that he has surely not demonstrated at any stage. In my view Rahul has ruined the possibility of being a credible leader for India by choosing to represent the MOST CORRUPT organisation of independent India – the Congress Party – an organisation that has STOLEN thousands of crores of public money, destroyed the lives of millions, and in general, been one of the most anti-India outfits one can think of (along with most other major political parties). Is it not criminal to loot taxpayer’s money? Is it not criminal to supply sub-standard road or other construction material as a result of which hundreds of people lose their lives? Is it not criminal to auction jobs in police stations and thus employ criminals? Is it not criminal to take bribes to let illegal immigrants into the country? This – and hundreds of other crimes – are committed by our major political parties today. Our ‘leaders’ reward those bureaucrats and policemen who connive or actively support such crimes. There is no place for the honest man in India today. How can a so-called ‘spiritual’ person consider criminals to be India’s saviours? And what about the lies that politicians feed us? Is lying no longer relevant in the world of spirituality. Why does the Congress continue to talk about socialism even as it adopts policies that could (in some cases) be best described as hypercapitalism (a corrupt crony capitalism of the sort they have in Russia). Why doesn’t Rahul Gandhi talk about capitalism as the ideal (which it should be)? – because in that case he’ll be forced to advocate and practice personal integrity, which is one thing he simply can’t now, having joined the Black Force. I agree that Rahul was born pure and innocent as a baby, but he now effectively heads a criminal outfit. People like him have to be brought to book. Had he chosen to resign from the Congress the moment he became an adult (age 18), the hope that some ‘spiritual’ people in India have of him may have been at least somewhat justified. But by dipping his hands in the filth called the Congress, he is no longer relevant to India’s future as a Great Nation. He is relevant to India’s future only as a miserable Third World nation. He will ensure it is kept that way. Note that corruption STARTS AT THE TOP. That has always been the case. It starts by people spending CRORES OF BLACK MONEY DURING ELECTIONS. Where does this huge amount of money come from? From LOOTING INDIA. And who has looted India? Our politicians, from the exchequer, from giving illegal favours to industrialists, from defence 'deals', etc. Who has led this loot since independence? – The Congress, but also most other parties. While many corrupt officials abound, they are often mere stooges, collecting money for their political bosses. The rot must be stemmed from the top. I’m not suggesting that we chase after these individual cockroaches. There is simply no time for that. And how many of these cockroaches can we destroy, anyway? In the end we may have to give all these enemies of India amnesty and rehabilitate them as some form as humans, merely to prevent a dangerous civil war in India. The solution we must aim for is to destroy the cockroach nest, not through violence but through the ballot box. Let the people of India be educated about these crimes. Let them demand a change. The way forward now is to find citizens who respect themselves and are willing to fight corrupt organisations, not ‘spiritualists’ who can’t distinguish right from the wrong, good from evil, enemy from friend. What FTI must offer to the people of India is the White Force, with policy competence. It doesn’t matter how many people are part of the Black Force. The voter will desert them when a credible offer is made by the White Force. I also suspect that many spiritual (i.e. religious) leaders are themselves a deep part of the Black Force. For instance, how many of them make clear that no black money should be contributed to their organisation? How many take donations purely by cheque? How many disclose their accounts publicly? Most of them, I suspect, will gladly accept ‘wealth’ stolen by corrupt politicians from hard working Indians. I am sometimes led to believe that there is no connection between spirituality and morality. Perhaps there never was. (This is an extract from one of my articles in TAGI, 14 March 2010). John Rawls wrote a book, entitled, A Theory of Justice. This is actually quite an amazing phenomenon for Rawls clearly had no clue about even the most fundamental conception of justice. The book missed the concept of justice by a mile, and ended up in total confusion. But that has been typical of all socialists, from the time that Rousseau expanded his conception of liberty into positive liberty space, and created a raggle of confused thinkers across the world who have vigorously DESTROYED LIBERTY and countless millions of lives over the past two centuries. This is a general problem across the world. Most "educated" people don't understand the basic concept of justice. But without understanding justice, we can only end up promoting evil – even as we imagine we are preaching peace and goodwill. In particular, social liberals and socialists don't understand the concept of ATTRIBUTION. They can't seem to identify WHO did a particular thing. They can't identify WHO owns something, WHO is responsible. As a result the whole world becomes like a ball of spaghetti in their mind, and they end up with DEEPLY contradictory prescriptions. Let's start with something that should be obvious to all but the most fanatic Hindutva folk: that destroying property is a crime. The gang of criminals known as BJP is (or was) headed by Advani. This nautanki, attired in a bow and arrow, went about actively advocating and organising the (a) trespass of property, and (b) breaking down property (Babri Masjid). That is a CRIMINAL action without any redeeming feature. 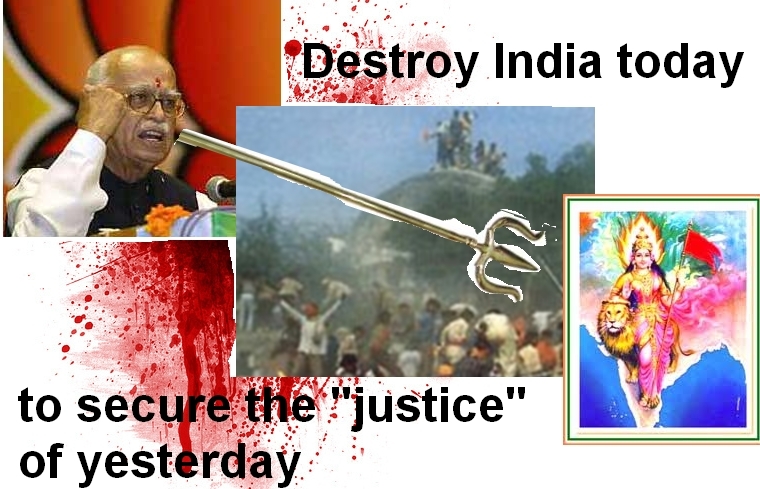 However, Advani, like his many confused socialist/collectivist colleagues, thought that he was ensuring justice! How so? He was under the DELUSION that since someone (Babur) had destroyed a temple (not owned by Advani – who was not even born then) 500 years ago so he somehow got the right to set things right by TRESPASSING and BREAKING someone's else's property today. A man with such a feeble mind would not normally be fit to govern a village but he became dangerously close to becoming India's prime minister! Such are the dangers of mobocracy. But you'll say: "But I never supported BJP, I'm a Congress man." You'll argue that such communal behaviour is below your dignity and that you would never stoop this low. However, if you are a man from Congress (or a socialist, in general), then you support caste based reservations. But reservations are PRECISELY the same thing: they are a CRIME against innocents! Both are based on the ridiculous idea of "justice of yesterday" – a greater piece of nonsense than which never existed. Basically if you support reservations, or you support the demolition of the Babri Masjid, you support the same thing: a WRONG and DANGEROUS concept of justice. So-called "secularist" socialists imagine they are different to BJP because they don't support demolishing Babri Masjid. But you can't support ANY form of injustice today on the ground that someone ELSE, dead and gone, committed a crime in the past. Unfortunately, that is the typical state of most of India's educated 'elites'. Whether you are a Hindutva fanatic or Congressi socialist, you are simply confused. It is time to wake up! I have explained the concept of justice in BFN, but obviously not many people have read it (or understood it, even if they have read it). So let me try to put out the basic idea of justice over the course of a few simple blog posts. I will extract both from BFN and the draft manuscript DOF. I hope that these posts will alleviate (if not eliminate!) the deep and fatal confusion of thought that is prevalent in the minds of socialists/social liberals/collectivists in India. Unless we understand the BASIC concept of justice, we can't possibly understand the meaning of freedom. Justice is ALWAYS as precise as a mathematical equation. If you miss out a key variable, or include extraneous variables, you'll fail to understand this basic concept of justice. And after that you'll lead a life of total confusion – and DEEP immorality. You'll end up advocating communalist/socialist/other collectivist ideas. Each of these ideas KILLS. Always kills. 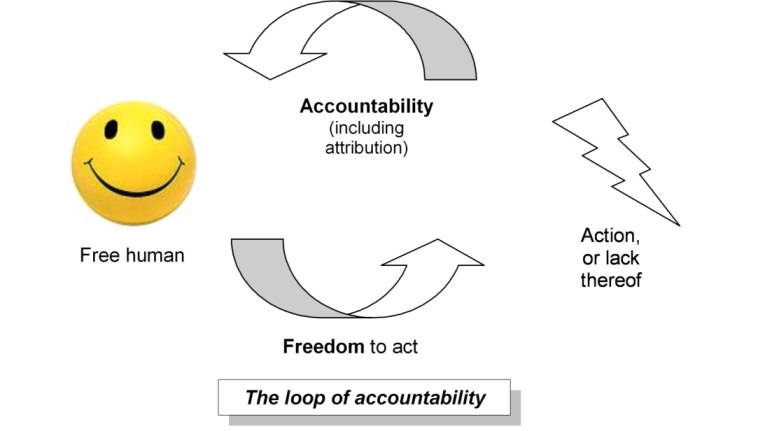 To begin with I'm publishing this Appendix on accountability, from BFN. Please read this to understand how simple and precise the concept of justice is. Please note the VITAL meaning of attribution for it is the source of ALL understandings of accountability, of all property rights, and of all rewards and punishment. If you can't identify WHO did a particular action, you are FINISHED. You will remain a mental cripple. Justice is the end of government. It is the end of society. Freedom becomes relevant only in the presence of more than one thinking, and hence responsible, human being. Responsibility is the key to freedom. Persons or animals that exhibit purely instinctive behaviour cannot be free since they cannot careful consider and evaluate the options available to them at each step, and choose, after due deliberation and planning, a course of action that they believe is appropriate. If a person with a chemical imbalance in their brains assaults another person, that person may not be acting freely. Similarly, psychiatrically unstable or intellectually challenged people may not be legally liable for their actions and hence cannot be deemed to be free. The challenge for two or more of such thinking and responsible people cohabiting the universe is for each of them to do what they want to do, while being mindful of the mirror need of others to do what they want to do. The only sustainable way to ensure a reasonable balance among such conflicting demands on freedom is for citizens of a free society to mutually agree to rules for joint living. These rules amount to a ‘Nash equilibrium’,[ii] under which everyone’s liberty is balanced either by arbitrary rules of thumb such as traffic rules, or by precise conditions of justice and accountability. This principle is actually very simple and very ancient: ‘Do unto others as you would have them do unto you’. As free people we are required to balance the forces of our physical and emotional energy in our interactions with others to make sure that no one else is made worse off by our actions (or inaction). Nothing requires us to go out of the way to help others. We may, of course, choose to do so, but that is not an obligation on us. All freedom calls for is that we must not ever make others worse off – for that would diminish their life, even if by a tiny amount. This accountabilityexistswhether it is enforced by a nominated third party or not. And yes, when we are called upon to rise and receive the just deserts of our actions, we cannot plead ignorance of the ‘law’ or of our mutually agreed rules as an excuse. The exercise of our freedom thus requires us to carefully consider the consequences of our actions on others. At most times our actions are likely to be perceived differently by different observers, and therefore they will have differential impacts or consequences. We are obliged to be aware of these differential impacts, and to take steps to minimize potential misunderstandings arising from our actions. There is a natural limit or check in place, of course. Were we to hurt others, we know that a retributory cycle could be precipitated, for then these others may attempt to diminish our life similarly. So we are naturally careful not to hurt others even if there is no external government to enforce such accountability. Accountability implicitly includes attribution,which isthe recognition or acknowledgement of the ownership of consequences. Attribution is the arrow that unerringly points to the relevant actor. For example, who is it that is responsible for a particular consequence? Who is it that has won a race? Who is it that owns this piece of land or that, or this piece of bread? We have a firm belief that the runner that runs the fastest should be declared its winner. When the deserts of our actions are not attributed precisely, and outcomes are determined by bias or by chance, we have a sense of disquiet; we object to the diminution of justice that it entails. Such simple and obvious things constitute the net import of freedom, which is, in the end, a very trivial and ordinary concept. But nothing is more important than this simple concept. I am calling this package, namely, the combination of our free choice and its natural accountability, including its matching attribution, the loop of accountability. I have also used this phrase in a few places in this book. This concept is best illustrated in the diagram that follows. Further, the Yin-Yang symbol in the beginning of this book can also represent the same concept. to whom did the consequences apply, namely, the attribution and precise debiting or crediting of outcomes. The keeping and settling of accounts is also known as justice. Let me illustrate with a very simple example. Let’s assume that I walk into a grocery shop and ask for bread from the grocer. The grocer hands me a loaf of bread. I pay the grocer and take the bread. That marks the end of a transaction where the loop of accountability has ‘closed’. There is no outstanding ‘residue’ left. What has happened here? We observe that, being responsible for myself and my family’s sustenance, I have freely,and of my own volition, stepped into the shop that belongs to someone else. I have then chosen to perform two further actions – first, to ask for bread, and, second, to receive the bread. Having done that, I have become instantaneously accountable for these actions. I must therefore necessarily perform the next action, namely, to settle the account and pay for the bread. I therefore pay for the bread. Note that exactly at the moment when I finish handing over the money, the ownership of the bread has changed. The bread as well as what I do with it is now attributed to me. The use of the bread is now in my sole discretion. This attribution applies even though the grocer did not write my name on the bread, nor did I register my ownership of the bread with the government. This simple transaction illustrates the concept of freedom in its entirety. Our free actions are always accompanied by an expectation that we close the loop of accountability which is immediately and always generated. No residue should remain. This accounting is as precise as a mathematical equality. Indeed, most of our transactions in a free society are seamless, and the loop of accountability is duly closed. We note that if no one ever violated the loop of accountability, we would never need a government. That would be paradise.